I don't know about you, but on ugly grey days when the skies open up, all I want to do is crawl under the covers and go back to sleep! But I've found that the best way to combat feeling grey is to outfit myself in stylish, colorful looks pieces that transcend the ugliness outside. Read on for some chic options to get you through the next rainy day! 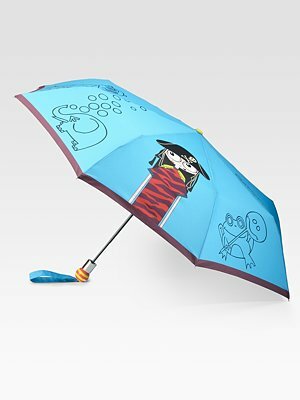 Felix Rey "Rain Rain Go Away" Clear Bubble Umbrella ($65): Can you think of anything cuter? 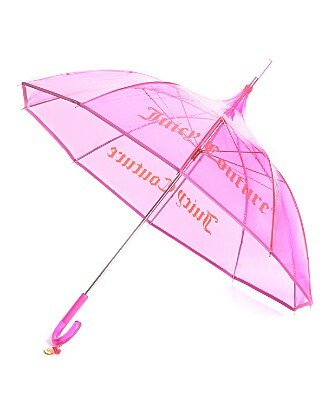 Not only will this bubble umbrella keep you completely warm and dry from head to toe ... but you'll turn heads simply because it's one of the most adorable umbrellas you could possibly carry! 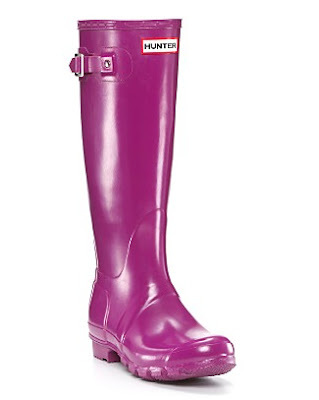 Hunter Original Rain Boots in Violet ($115): No gal's rainy day wardrobe is complete without a pair of Hunter Wellies. And while some may prefer neutral hues that go with everything, I like a little pop of color to combat the ugly color of the sky! Juicy Couture "Pagoda" Umbrella ($48): If you want to look utterly ladylike -- and trust me, I know Juicy doesn't usually deliver on that front -- this umbrella may be just the thing. Tory Burch Metallic Nylon Trench Coat ($425): I'm always concerned about getting my clothes ruined by the rain ... but with this glossy nylon topper, that's no longer a problem. 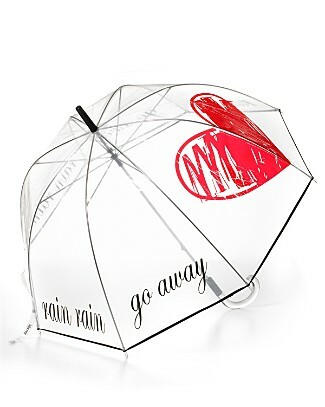 Marc by Marc Jacobs Miss Marc and Friends Automatic Umbrella ($68): Perfect for the days when the rain puts a pout on your face ... because the iconic Miss Marc is always pouty! 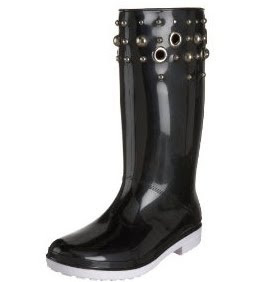 Stuart Weitzman Women's Splashy Rainboot ($121.50): Bubble studs and grommets infuse this slick rainboot with glam-rock, downtown edge. 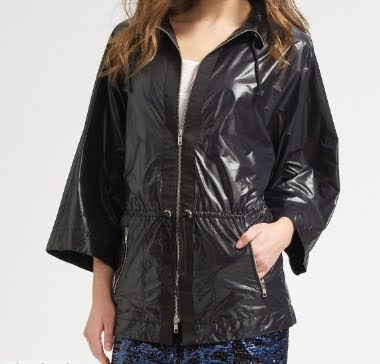 Burberry Hooded Rain Jacket ($695): The Burberry rain jacket is a time-honored essential for the discerning woman's wardrobe. It's smart to invest in a classic that will be around forever. 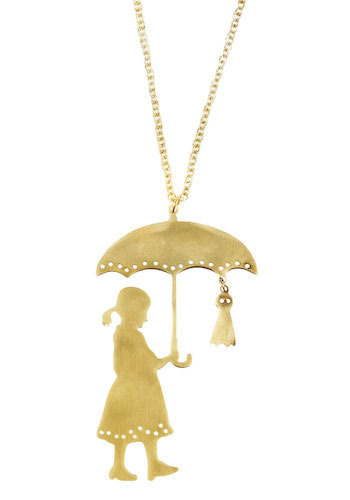 ModCloth Under My Umbrella Necklace ($49.99): Okay, this necklace isn't something that will keep you warm and dry. But seriously, could it be any cuter? 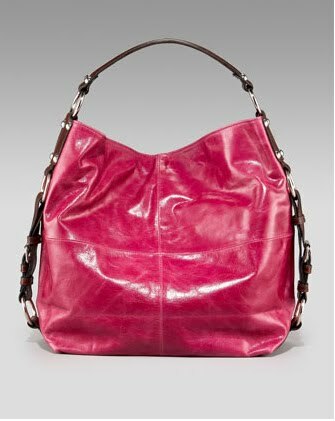 Tano Boogie Bucket Hobo ($200): Worried about taking your leather bag out in the rain? With this bag, you don't have to be. Tano bags are specially treated against water damage -- and even when they weather with age, they still look unbelievably fantastic.